I finnaly finnished catching all 28 Unown. uhh..haha. So did i actually. I took a looong time catching unown ! though, took me about half an hour >.< Which was pretty boring. And catching unown is probably only fr pokedex data or your own collection. Yea. It was awesome when finaly after about 2 hours of looking for Unown ? and ! i got them. Unowns B, E, O, ! and ? took me a long time to find. I traded over my Kecleon from Emerald to catch the Unown and simultaneously find out what their element they had as the output of Hidden Power. I gave each Unown a nickname according to their Hidden Power type (eg. Unown with Hidden Power Ice => Unown-Ice). Im planning to sending it over to my DP. hmm..can u trade stuff from like ruby, leafgreen from diamond and pearl back and forth? I'm not really sure, because i'm trying to increase my dex by trading over stuff from there, but i dun think it works. Haven't tried it anyway..
That is a no no. 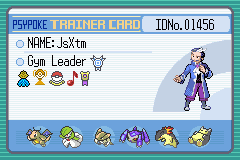 Only Pokes from lg, fr, r, s, emerald etc, can only be transfered to the pack. No back and forth, which I think is pretty lame but that's just me. I'm still working on mine. Which Chambers are and in? Chambers 7 and 1, respectively. That helps me to figure which UNOWN that already been caught. I only encountered one Unown that had Hidden Power Ice. Most of them had Ground or Rock. Try looking on the main site. Oh, and thanks for necromancing this 3 month old topic, too. In the Ruin Maniac cave after you get all 26 of the other Unown, at the very very end there's a door. Go through that door to find the Unown of ! and ?. As for FRLG Unown ! and ?, I gave up after half an hour of looking. More frustrating to find than B or V.
Actually, they are in 2 different caves. I may have this switched, but I think the ? is found in the same cave the A is found in, all the way to the right, and the ! is found in the same cave the Z is found in, all the way to the left.